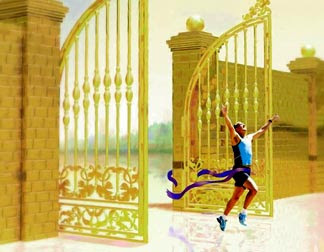 Salvation And Survival: "I Have Run The Race and Won My Crown"
"I Have Run The Race and Won My Crown"
2 Timothy 4:7-8: I have fought the good and worthy and noble fight, I have finished the race, I have kept the faith [firmly guarding the gospel against error]. In the future there is reserved for me the [victor’s] crown of righteousness [for being right with God and doing right], which the Lord, the righteous Judge, will award to me on that [great] day—and not to me only, but also to all those who have loved and longed for and welcomed His appearing. 1 Corinthians 9:24-27: Do you not know that in a race all the runners run, but only one receives the prize? So run that you may obtain it. Every athlete exercises self-control in all things. They do it to receive a perishable wreath, but we an imperishable. So I do not run aimlessly; I do not box as one beating the air. But I discipline my body and keep it under control, lest after preaching to others I myself should be disqualified. If you have been following this blog for very long, then you know that I love history, and especially Biblical history. You will also know that our Home Church group is studying the Book of Acts. We have arrived at Chapter 9 in our study and worship of God and the Bible, and although this chapter features the important event of Saul's conversion, I found myself curious about where one of the seemingly minor verses led me. In Acts 9:30, Scripture tells us that the Brothers in Christ sent Saul off to Tarsus after his preaching in Jerusalem won him some enemies among the Greek Jews (Hellenists) who then tried to assassinate him. Initially, I wondered how far from Jerusalem Tarsus might be. When I discovered that it was 356 miles, and then remembered that this was Paul's home town, I wondered if this was some form of encouragement from the Brothers for Paul to soften his approach in his preaching by removing him from situations that could harm the growing Church. You see, we don't really hear from Paul again for 14, nearly 15 years. He informs us [in Galatians, Chapter 1] that immediately after his conversion, he went to Arabia for an undisclosed time and then went back to Damascus. He then tells us that three years later, he went to Jerusalem and stayed with Peter for 15 days. In Galatians, Chapter 2, he informs us that he taught and preached in the regions of Cilicia (where his hometown of Tarsus was located) and Syria, before returning to Jerusalem fourteen years later. So what was he doing during those 14 years, and what does it have to do with the verses I chose today? We are all familiar with these verses which bring to mind athletic competitions, running races, and winning prizes. But I was fascinated to find that during these particular 14 years that Paul was absent from Jerusalem, the Olympics were held in Antioch in the year 44 A.D. This sporting event affected all of the Roman Empire. It gathered representatives from far-off cities, created new trade links and promoted the cultural life of the time. It is very possible that the commercial "world exhibitions" connected with the Olympics also tied Paul's family business of tent-making to the Antioch exhibition. At the same time he may have followed the Olympic competitors' sports performances. It certainly appears so, from the references in 2 Timothy and 1 Corinthians. It is apparent that Paul is comparing an athlete's race to that of a Christian's; with both earning the prize of the victor's crown at the successful completion of the race. I know that some people have a problem with the idea of Christians and "rewards", falsely assuming that this promotes a doctrine of "works for salvation". But there are five heavenly crowns specifically mentioned in the New Testament that will be awarded to believers. Jesus, Himself, in His message to the Church in Philadelphia, says, "I am coming soon. Hold fast what you have, so that no one may seize your crown". And Paul knew there was a crown of righteousness waiting for him in heaven, and he was ready to receive it. He was certain of it. He plainly states it in 2 Timothy 4. Some people may wonder if we will walk around heaven with crowns on, and everyone will notice who has the bigger and better crowns. But in Revelation 4:10, the elders surrounding the throne of God take their crowns and cast them before Jesus - giving any trophy or reward they have received right back to Him. I have a suspicion that we will do the same; acknowledging that His work on the Cross made it possible for us to receive the crown in the first place. But I want to point out that there is another reference to an actual sporting event in the verses in 1 Corinthians 9. Every other year in the city of Corinth, they organized the famous Isthmus Games outside the city. They were second in prestige only to the Olympics. At them the sportsman had to swear that he had trained for the games for ten months and was ready to compete according to the rules. So, you can see in these verses that Paul is careful to stress "self-control" and the possibility of being "disqualified" -- terminology that refers to his spirit mastering his flesh, and the possible loss of his reward [not salvation]. In the terminology of sports, "disqualified" signifies a person who has been rejected by the judges of the games, as not having deserved the prize. So Paul is concerned that he might be rejected by the great Judge; and to prevent this, he ran, he contended, he denied himself, and brought his body into subjection to his spirit, and had his spirit governed by the Spirit of God. All this points to the fact, that as a Christian, we must take our entrance into the eternal Kingdom of God seriously; not everyone will complete the race; and how we run the race truly matters. In the end, both 2 Timothy 4 and 1 Corinthians 9 point to the imperishable crown that we will receive at the judgment seat of Christ, where believers are rewarded based on how faithfully they served Christ. How well did I perform the Great Commission? How victorious was I over sin? Did I obey the Lord when He prompted me to act on His part, or did I only consider my own desires? This is the Bema Seat Judgment, reserved for Believers. And it is a promise for all of us - but only if we will set our focus on heaven and on Jesus, who both walked the earth and now reigns in heaven, who is waiting to receive us .. ready to congratulate us on participating in a race well-run.